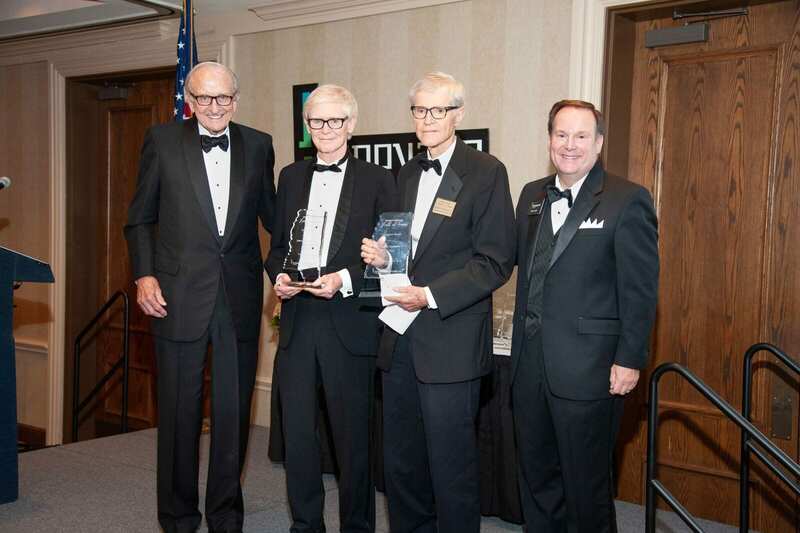 Wade H. Creekmore, Jr. and James H. Creekmore, Sr., founders of C Spire, the largest privately held wireless company in the country, headlined the honorees present at the 2018 Mississippi Innovators Hall of Fame Awards Gala at the Country Club of Jackson on September 13, 2018. 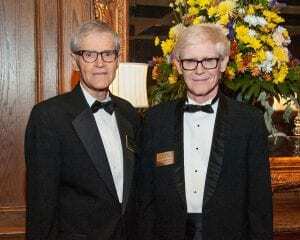 The Creekmore brothers received the “Legend Award,” the highest honor bestowed at the event. The Gala’s presenting sponsor was mTrade of Oxford; the Mississippi Innovators Hall of Fame is a production of Innovate Mississippi. To start the evening’s ceremony, Innovate Mississippi CEO Tony Jeff introduced representatives of the four companies honored as 2018 Innovation Impact recipients—ALGIX, BHN, EdgeTheory and Kopis Mobile. Jeff then introduced Innovate Mississippi board member Jan Farrington, who served as host of the event (with her husband, Lawrence), who introduced the first inductee, Gail Pittman. 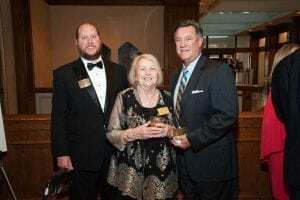 Pittman was inducted into the Mississippi Innovators Hall of Fame in recognition of the success she’s had going from a home-based pottery business to a multi-million dollar manufacturing and licensing firm. 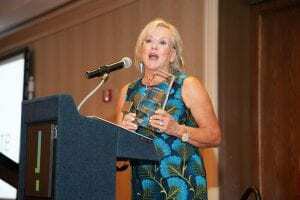 Gail Pittman thanked her husband, friends and business associates for helping her achieve success. “Tell me how blessed I feel right now,” said Gail Pittman, as she received her award. “He encouraged me,” she said, “So much so that later on… we would go to a dinner party and he would say, ‘This is my wife Gail. She paints bowls. Do you want one?’ He was my first salesman, too,” she said, to appreciative laughter. “This is a great moment for me. I am very honored. Thank you,” she said. After the video, Leo’s son Lee Seal accepted the award and relayed another anecdote about Leo Seal Jr.
“There were so many nuggets of wisdom… one came to mind,” Seal said. “He didn’t take very many vacations, but he liked to go to the Olympics. A friend of his asked him ‘who is going is run the bank while you’re gone?’ He said, ‘the same people who run the bank when I’m there.’” Seal then accepted the award on behalf of his family and the staff at Hancock Bank that had been a huge part of Leo Seal Jr.’s success. 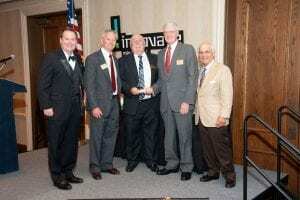 Triton Systems founders Robert Sandoz; Frank Wilem, Jr; and Dr. Ernest Burdette (center three) accept induction into the Mississippi Innovators Hall of Fame. The Triton founders—Dr. Ernest Burdette, Robert Sandoz and Frank Wilem, Jr., were present to be inducted into the Mississippi Innovators Hall of Fame, recognized for their innovations in building ATM machines that didn’t have to be attached to banks, ultimately growing to the point that they sold more ATM machines in one year than any other company in the country. “It’s an unusual situation that you can be friends after running a business for 25 years,” he said. For the final presentation of the evening, Dr. Bill Rayburn, chairman and CEO of mTrade, introduced former Legend Award winner Ambassador John Palmer who, in turn, introduced Wade and Jimmy Creekmore. Wade Creekmore, in accepting his recognition, used the opportunity to instead praise Dr. Jeff Bullington, the leader of the chess program in Franklin County that Creekmore has helped create for public school students. Creekmore gave Bullington credit for the success of the program and had him stand up to be applauded by the crowd. When Jimmy Creekmore took the podium, he thanked all the people in the room and said “I wish so many other people who have helped Wade and me could have been here, too.” He congratulated the other Mississippi Innovators Hall of Fame inductees and Innovation Impact honorees. “I want to say that Mississippi is doing very, very well. A lot of people who are responsible are here tonight from the entrepreneurial and innovative world,” he said.